New Orleans, LA – Due to intense protests, the city of New Orleans has been having trouble finding contractors to remove the confederate monuments. Every crane company within a hundred miles has received threats, making it extremely difficult for the city to continue with its plan to put the monuments in a museum. With all options exhausted, the city council turned to Robosaurus, the one machine no one would dare threaten, the one machine everyone had been conditioned to fear and respect since attending their first Monster Jam. At approximately 6:30AM, a group of protesters gathered around Robert E. Lee. When city officials showed up, the neo-Confederates immediately began shouting, knowing the officials were there to facilitate the removal of the monument. Suddenly, the ground began to shake. The rumbling down Howard Avenue gave way to a beast, slouching towards Lee Circle to be born. “Look everybody, it’s Robosaurus! He’s here to save the general!” shouted one man with glee. But he was not there to save the general. The protesters’ surprise quickly turned into dread as the monster walked right past city officials and made a beeline for the statue. They watched in horror as the animatronic dinosaur violently went to work, shooting a blue flame into the general’s face before biting him in half. “Oh no, our heritage!” they began to scream. “Why Robosaurus? !” they pleaded. They felt their institutional consciousness dissolve betwixt the hydraulic jaws of a new South. In less than five minutes, all the heritage was gone, and everyone was saaaad. They scattered to the four winds, with only the rhythmic thumping of Louisiana’s substandard highways to accompany them home. Talk radio melted into white noise. All their bumper-stickers recoiled back upon themselves and collapsed to the pavement before being ground into paste. Only the sad tinkling of silverware echoed throughout the exit-ramp Cracker Barrels. They were a nation of defeated and demoralized people whose roots had been severed, and they instinctively understood what horrors were possible for peoples deprived of their roots. Robosaurus certainly is an extremely sophisticated machine, which must be operated by computer software and hardware. Robosaurus must be programmed to carry out its mission of disposing of the Confederate Monuments. At the risk of being crude, when Robosaurus relieves himself after eating the monuments, does the monument excrement from Robosaurus resemble the former likenesses of the monuments in any way whatsoever? 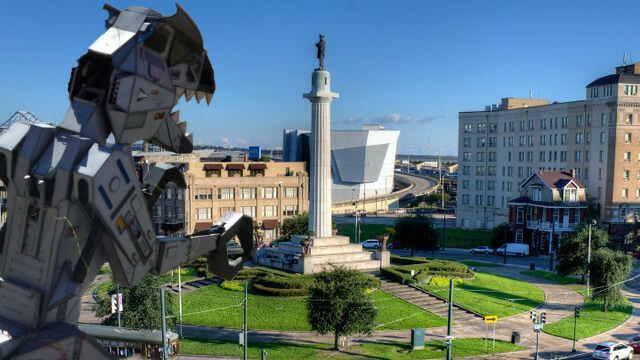 Because if Robosaurus leaves behind piles of tiny Confederate Monuments, maybe the City of New Orleans can sell them to those of us who would like to have “miniature” reminders of our heritage. Why isn’t anyone commenting? You read the articles; please comment! Share your imagination and ingenuity with us!